Queen's Quest has been released! 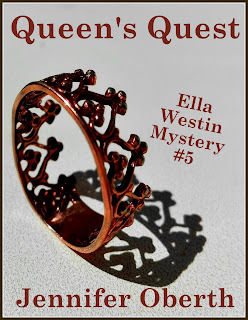 #5 in the Ella Westin mysteries. Check it out at Smashwords, Amazon, Apple and many other places. Ella Westin is tasked with investigating a haunted house – though she doesn’t believe in such things. A clue leads her straight into the heart of a plot to rob the Port Bass Museum. Can she catch the thieves or will she become one of them? This is the fifth story in the Ella Westin Mysteries and is 30,644 words - only 99 cents!!! !